Yes, we are just hours away from our first (of many!) elimination round matches. The start of the #USAvBEL match cannot come any sooner. And, I have lots of (remote) work to do today and the Argentina vs. Switzerland match to keep me distracted until the 17:00 (or 5:00 pm) local time kick-off of the USA bout. So, to keep me focused (and before I dive into my next major work item), I thought I share the amount of flying we did to catch all three USA group stage matches these past two weeks. As many of you have likely read, Team USA endured the worst travel schedule of any of the teams in the World Cup. From their base of operations in São Paulo to the three cities in the north, the USMNT tallied about 8,900 miles. Interestingly, our opponent for the match later today earned the honor of traveling the least amount for the group stage. Maura and I came fairly close to equaling this long distance achievement (we did not have the "luxury" of flying back to São Paulo after each match, like the USMNT did), racking up nearly 6,900 air miles on our own journey through the first phase of the FIFA World Cup finals in Brazil. I can actually feel the physical toll and impact of multi-legged journey to Natal, Manaus and Recife. For a grand total of 6,896 miles! We actually flew more air miles than Team Belgium did to get from their home nation to their camp in São Paulo state (approximately 6,000 miles). Yeah, it was brutal, but so worth it! And, I think we would have made the trip up north to Salvador for today's match if we both weren't swamped with work and just completely wiped. Nevertheless, I'm hopeful our big investment will have more than a little impact on the team's performance later today...where we will make waffles out of them Belgium! I will be the first to admit, that it's kind of sad that after spending the last several days without a reliable Internets connection, I'm now overdosing on the 'Tubes from the departures area of the São Gonçalo do Amarante–Governador Aluízio Alves International Airport (a/k/a the "New Natal Airport"). That hasn't taken anything away from our first fantastic stop on this tour of the USMNT group stage matches. The positive side effect of my Internet jones? I can FINALLY share some of the backlog of images and experiences capture from my trusty Nokia Lumia 925. Well, remember I mentioned all that rain in Natal? The morning of the USA vs. Ghana match started to show signs of clearing up (or at least not raining). We took advantage of this break in the chuva to take our own pre-match stroll on the Ponta Negra beach just outside of our hotel. Along our walk, we watched folks play a little beach soccer, get runs in, and show off lots of USMNT gear. I chatted quickly with a pair from the mid-west of the USA, where I said with confidence we'd win 2-1 and capture the three points. They weren't as convinced and just hoped for a solid draw. I wasn't the only one believing a 2-1 victory was in our future. A very popular shirt sold in the stores around Natal gives you the ability make your own predictions. Kind of cheap and silly, but both the one hanging in the store across from the beach and on a Brazilian spectator seated in front of us at the stadium featured the same prediction. After the walk, we quickly showered up and donned our USA gear to meet with our driver (and our two new American supporter friends) to head off to our first stop: the U.S. Soccer Pre-Match Party at "Peppers Arena". Okay, after a little more than "15 minutes" (or 45 minutes when you convert Natal time to the regular one you and I know so well) our awesome driver arrived and took us to the party. I already shared some of the highlights of the party, so let's just skip ahead to the craziness at the American Outlaws gathering near the stadium. Our driver left us at a Petrobras station on the opposite side of Av. Senador Salgado Filho and we made the hike over the pedestrian bridge to Rodizio de Pizzas to meet up with safely a "zillion" AO members already in a full lather of chatting, flag waving and other heart pumping pre-game prep. (NOTE: The photo above is from near Shopping Natal. We were MUCH closer to the stadium when dropped off). Our little band of supporters stayed for about 20 (real) minutes before we headed off to the stadium. Our March to the Match was fun and good natured. I had a small surprise when we bumped (almost literally) into former US International and MLSer Jimmy Conrad who was filming for KICKTV just outside of the Arena das Dunas. Getting through security and having our ticket punched was a heck of lot easier than I'd expected. Not that I was expecting chaos and bedlam, but again this is a place where they haven't finished either the airport or the roads around the stadium. But. Once we got to our seats, it really hit home that we were AT A WORLD CUP MATCH AND WATCHING THE US MENS NATIONAL TEAM!!!!!!!!! We even entered just as the USA team bus arrived to the stadium and we cheered them all the way into the venue. The evening was amazing and we still have at least two more of these matches to attend. Holy cow, this was an amazing experience which had its highs (like Deuce's goal) and lows (Jozy's injury), and it did take us more than an hour to get back to the hotel. Some of this was due to Vice President Joe Biden's motorcade shutting down the roads. He and his 35 vehicles (and 2,000 gunners) passed by us as we waited at that very same Petrobras for our driver to navigate us through all this chaos and back to Ponta Negra. Maura and I grabbed a super late dinner at a nearby hotel as the nightcap to our day full of adventure and thrills. We wanted to rest up a little bit, because the we had to go see the World's Largest Cashew Tree before we headed off to Manaus for round two. Oh, we did see the tree and it's huge. Sadly, the poor Internets has made my attempt to provide a full multi-media recap of our past two days impossible. Man, I have pictures, videos and more that I'm super anxious to post to show you how awesome (and trying at times) the Natal stop on this World Cup journey has been. 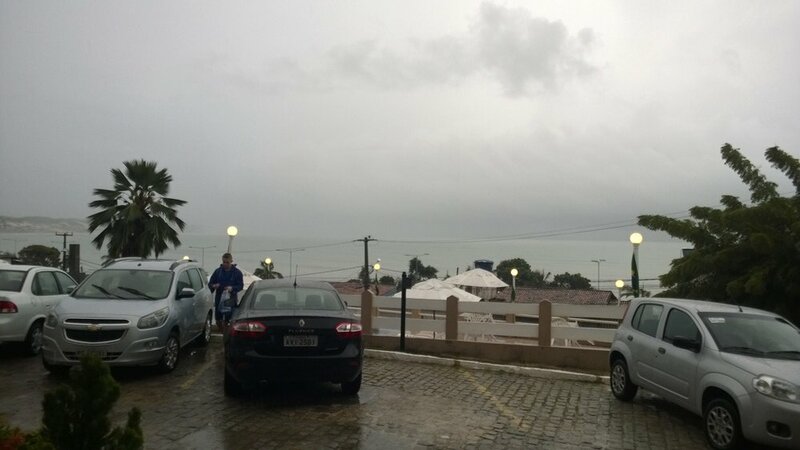 After we (with our two new friends from the States) spent hours at Shopping Natal waiting for the stores to open and searching for some foul weather gear, the rain did let up in time for the pre-match festivities and the game itself. Funny how that works. We did find the last four rain ponchos in the city, which is why the rain stopped. Thanks to Maura's negotiation skills, we had a driver to take us to the U.S. Soccer pre-match party at "Peppers Arena" (a makeshift and temporary venue sandwiched between car dealerships), to Arena das Dunas for the game and then back to our hotel after an anticipated victory. The pre-match party was cool. We had screens everywhere to witness the German thrashing of CR7's Portugal, "enjoyed" some pricey cans of Budweiser beer and a Brazilian version of bad American pizza. Just after the end of the GERvPOR match, family members of the Yanks arrived to have their own pre-match meal and fun before boarding their buses for the stadium. We got to chat with a few of them, including Jozy's older brother (who is a nearly a twin with that same signature smile) and Fabian Johnson's sibling. We saw a quick game of "kick the ball and run around" being played by the future USMNT players made up of the offspring of Dempsey, Jones, Bradley and others. The cherry on top of this awesome sundae was free U.S. Soccer scarves handed out just as we left ourselves. A nice souvenir. Our driver took us over to the stadium area where we met up with about a "million" American Outlaws (the famed USA supporters group). I wish I could upload the video of the packed open air pizzeria and the none stop chants. I'll fix that once we get some good wireless again! We did our own "march to the match", walking the mile from the AO pre-func to our seats in the Arena das Dunas. People were cheering and chanting the whole way and lots of good natured taunting between fans of all the teams, not just the USA and Ghana. I won't recap the game, but I will say what an emotional roller coaster of the Emerald City's own Clint Dempsey scoring the opening goal in 32 seconds, followed by the injuries to he and Jozy. Then the nail biting of watching the USA getting pounded by the Ghanian attack with so little possession of their own, the late goal by Ghana and then John Brooks stunning game winning header in the closing minutes that took place in the goal closest to our seats. And, the rain returned just as we exited as victors. Funny, eh? Today is our last full day in Natal, and the rain is back. We'll catch a few quick sights before finding a dry location to watch the Brazil-Mexico match. Oh, and I need to rest my voice as I think I lost it somewhere in Section 220 last night. Let me know if you find it! ...except when we have the World Cup in town. After a long day of travel from São Paulo (via Brasilia), we arrived at the brand spanking new Natal airport...only to spend the next hour getting our rental car. I honestly believe securing our home mortgage was easier and less time consuming than what it took to get this stinkin' Renault. Next step: drive to our hotel...through the pouring rain and a GPS free of any of the new built roads. When in Rome...er...the North East of Brazil. Sadly, this beautiful beach town is experiencing some of the worst rain in long time. As this ProSoccerTalk article notes, the over 36 hours of rain is really taking its toll on the city and the pitch. At least we found some cool bars along the beach to watch a few matches, enjoy some local grub and beers, and marvel in the crazy surfers trying to take advantage of the huge waves. Today, we're sheltering at a Natal shopping mall to get some reliable Wi-Fi, some new foul weather gear and hang with a couple of new friends (USA supporters, of course!) we made at the hotel. While the weather conditions haven't lived up to expectations for our first stop, the friendliness of the supporters from all the other teams has been amazing. We met a dude who flew in from Ghana while boarding our connection in Brasilia. We both felt the pressure and importance for our respective nations to beat the other in the match here tomorrow, but left each other with a warm smile and good luck handshake. We also hung out with lots of Mexico, Aussies, and even a few local supporters while watching the matches yesterday. Everyone is truly enjoying the games and there is no evidence of issues or politics. While FIFA has its well publicized problems, what these games do for the fans of the World's Game is super positive. Time to go buy a better poncho! Thanks to a recent Tweet from the "fine folks" at FIFA, I can share with you a "colorful map" of the host cities for the World Cup. I've marked up the key places we'll be visiting during our time in Brazil. From our base of operations in São Paulo, we'll be traveling up to the Amazon and the north east of Brazil to support "The Yanks" as they do battle against Ghana, Portugal and Germany in three of the twelve host cities for the tournament: Natal, Manaus and Recife. Even though it's technically winter (well, actually winter), these places are expected to be hot and humid. What else would one expect when traveling to the word's largest rain forest and beach cities close to the equator! We've got lots of shorts and sun block to keep us as comfortable as possible. We'll keep you posted.